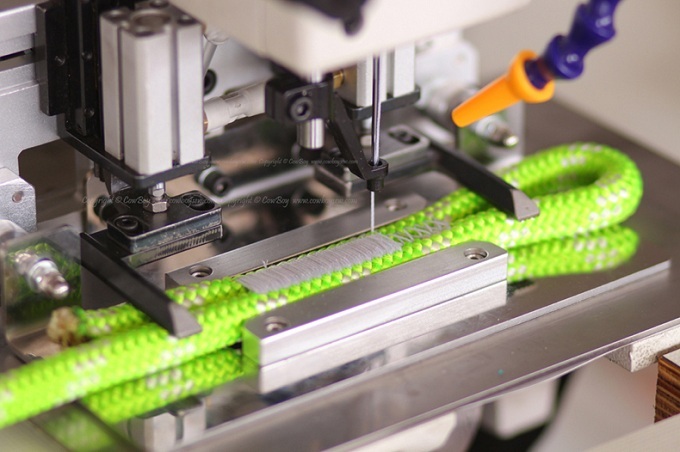 Heavy duty Bar-tacking sewing machine can be widely seen reinforcing Kernmantle ropes, static climbing ropes, dynamic climbing ropes, rope lanyards, slings & cords, safety harnesses and military gear, with strong and uniform stitch. Because most of the rope end bar tacking is used on is critical to survival, it is important to find the right bar tacking sewing equipment that can create extra safety and durability on the seam. Hightex 71008R Heavy duty automatic rope sewing machine to make sewn eye termination on Kernmantle rope: the best sell rope stitching machine, can easily stitch 2 ropes with each of 16 mm (diameter); With 130 × 20 mm of sewing area; Extra large Barrel shuttle hook and bobbin capacity offer high efficiency; Pre-programmed, ready to operate; Programmable (free software), updating and storage easier. Hightex 72008R Heavy duty bar tacking sewing machine to make sewn eye termination on climbing ropes and cordage: this rope end bar tacking machine is same to 71008R, but with longer bar-tacking sewing seam, can easily stitch 2 ropes with each of 16 mm (diameter); With 300 × 20 mm of sewing area; Extra large Barrel shuttle hook and bobbin capacity offer high efficiency; Pre-programmed, ready to operate; Programmable (free software), updating and storage easier. Hightex 7273PLK/R Automatic rope bar-tacking machine to make sewn eye termination: the second generation of extra heavy duty automatic bar tacking machine with higher sewing speed and robust construction; Can easily stitch 2 ropes with each of 20 mm (diameter); Extra large Barrel shuttle hook and bobbin capacity offer high efficiency; Pre-programmed, ready to operate. Hightex #7273PLK Heavy duty electronically controlled pattern sewing machine most suitable for safety harness and belt: the second generation of extra heavy duty automatic pattern sewing machine for stitching 2-3 ply nylon or polyester webbing slings with each of 3.5 mm, using very strong sewing thread up to V415 (1500Dx3) -- highly specialized electronic control systems, robust construction and sophisticated clamp for perfect seam quality & maximum productivity. Extra high needle penetration force allow the processing of extremely thick materials, such as Nylon, Polyester, Polypropylene, Military Webbing, Kevlar, Vinyl, Leather and Canvas. Hightex 733PLC/R Automated bar tacker for sewn terminations on very thick ropes: the presser foot has an ultra high lift of up to 32 mm, can easily sew 2 ropes with each of 28 mm(diameter); Super large shuttle hook and bobbin capacity offers high efficiency in sewing products using extra thick thread and has a thread rating up-to size #0 - #00; Pre-programmed, ready to operate. Hightex MLK500-2516 High speed automatic pattern sewing machine for safety harness and seat belts: this programmable sewing machine can make a revolution in your sewing production. Ideal for stitching 2-3 ply nylon or polyester webbing with each of 2.5 mm, using very thick sewing thread up to V277 (=T-270, 840Dx3) -- 3 times large rotary hook and 1600 rpm high speed guarantee high productivity in the manufacturing of safety harness, fall protection equipment and car seat belts. 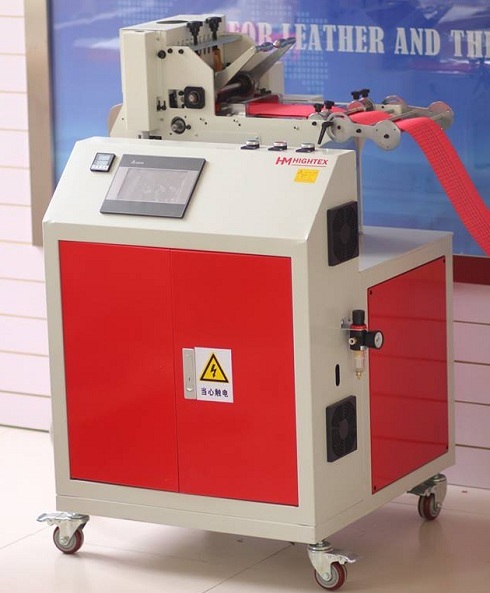 Hightex 828A/828B Automatic hot webbing cutting machine for safety harness and ropes: a professional hot cutting machine for heavy duty synthetic straps, belts, harnesses webbing and ropes. Cut and seal the material in same time for simple future processing; Top and bottom feed mechanism ensures precise cutting length.